Customer reviews are a fundamental part of your local marketing efforts and online reputation. If you can get enough good ones, they can go a long ways. A slew of good reviews can boost both your local search ranking as well as click-through rate (CTR), which should ultimately lead to converting more customers. A Local Consumer Review Survey (2012) showed that approximately 72% of consumers trust online reviews as much as personal recommendations, while 52% said that positive online reviews make them more likely to use a local business. But building customer reviews, and doing it ‘the right way’, especially on Google (with all of their flip-flops and recent updates) has been a dizzying process for SMBs. Below is a breakdown of some of the things that our team, and other industry experts, have found to be effective tactics in building high-value customer reviews for your business. You should coach your staff to notice when you have a highly satisfied customer, and to politely ask, “Would you be willing to leave us a review?” If you have the customer’s email, personally send them a link (see Tip #2) to your Google+ Local page. You can do this in conjunction with with handing out a business card, with a QR code on it that directs them to your Google+ Local page. Don't count on customers tracking down your listing(s). If you give them the exact URL, they will be more likely to go ahead and leave a review. You want to make the process as frictionless as possible. That big long number is the the unique CID of each Google+ Local page. Once customers visit the link, all they need to do is click the ‘write a review’ button. Want an easier to remember URL for your Google+ Local Page? Use gplus.to to shorten the link. Google wants to know what the local community is saying about your business so you should make it as easy as possible for your customers to socially engage. Add links on your website, and post your Google+ Local Page URL in your email signature, on your customer thank you letters, receipts, etc. Make that real customers with established Google+ accounts. A large chunk of Gmail users by now should also have a Google+ account or be able to readily set one up (Google+: A Quick Start Guide). Part of this push involves Google’s review spam algorithm increasingly cracking down on attempts to game the system with temporary fictitious email accounts. Business owners who write their own (fake) reviews can end up in Google purgatory. Google employs a number of measures to prevent fake reviews including checking to see if reviews are being left by an email address tied to the business's domain or stemming from the same or similar IP address. Be wary of reputation management services that promise to generate reviews for your business. This strategy could quickly backfire. Google is also specific about not incentivizing for reviews. Reviews are only valuable when they are honest and unbiased. For instance, as a business owner or employee you should not review your own business or current place of work. Don’t offer money or product to others to write reviews for your business or write negative reviews about a competitor. We also discourage specialized review stations or kiosks set up at your place of business for the sole purpose of soliciting reviews. As a reviewer, you should not accept money or product from a business to write a review about them. Additionally, don’t feel compelled to review a certain way just because an employee of that business asked you to do so. Finally, don’t post reviews on behalf of others or misrepresent your identity or affiliation with the place you are reviewing. Make sure you've taken a look at the entire review content guidelines and understand the difference between asking customers to review on their own time (like handing out printed QR codes or sending reminder emails), which is okay, and incentivizing with free gifts or discounts, which is discouraged. Our research shows that some of the biggest improvements in conversion rate increments occur between 1 and 10 reviews, while the most significant ranking impact for Google local listings occurs after hitting 10 reviews (since the 30-point Zagat scale was introduced). The key factor here being that overall sentiment leans positive. For many business types, it’s important to generate a minimum number of reviews, but there also seems to be a diminishing value in the quantity of reviews beyond 10. Aim for a continuous stream of reviews, but be mindful of how quickly you generate them. You don’t want to be penalized for a Fiverr-like surge. This is what we in the industry refer to as the "velocity" signal. Google will likely consider a high velocity of review gathering and social activity (i.e., +1's, check-ins, and shares/likes) suspicious. This is just another way Google determines whether a review has been gained from a reliable source. So if possible, don't get them all in one day! Reviewers on Google must now have an established Google+ account (Gmail). This improved reviewer authentication also means that native Google+ Local reviews have become increasingly important as a ranking factor. However, you shouldn’t just focus on Google reviews; ask customers to review you elsewhere, too. I mean, it looks weird if you have 42 reviews on Google and none on Yelp, right? Search engines look for corroborating review data across the local ecosystem. Reviews on relevant third-party sites are important to your Google local ranking. Focus on targeting niche review sites that are popular for your business type. Tip: Suggest a few sites (no more than five options) in a courteous ‘Leave Us Your Feedback’ type email and allow your customers to pick whichever one they find easiest and most convenient. You can segment your customer email lists and limit requests for Google reviews to Gmail accounts, or suggest that customers use their Facebook login to review you in places like Citysearch and Insiderpages. Yahoo Mail is common and a link to your Yahoo Local listing would provide an easy option. You're good enough, smart enough, and - doggone it - people like you. Fortunately, nobody expects your business to be perfect. In fact, if your business has nothing but 5-star gushing reviews, it might strike consumers as a bit suspect. Do the reviews sound normal? Consumers want to read genuine reviews from real people. Getting a mediocre or bad review is not necessarily a bad thing. If searchers see a less than perfect review among several other positive reviews, they might find that more believable. Your local ranking won’t be affected much by the occasional bad review, as long as the overall sentiment is positive. From an SEO perspective, quantity of reviews still seems to trump quality. On a side note, it’s easier to spot a bogus review than you might think. Our team at EZlocal has cut our teeth squashing thousands of spammy reviews submitted to our business directory over the years (24/7 towers are the worst offenders by far). We’ve seen it all, and we can only imagine what preventive mechanisms Google has going above and beyond our own. Reviewer authority matters. Active reviewers in your local community pull more weight. Google Top Reviewers, for instance, have the most authority (similar to Yelp Elite status). If you can land a review or two from these active reviewers, consider it a bonus. Google’s "PlaceRank" patent hints at these types of ranking signals with references to things like "StatureWithinCommunity". Google likes everything to be as contextual as possible. Reviews are considered more contextual (not keyword stuffed) when they contain relevant phrases with specific products and services you offer and/or a location keyword in the review body. Hats off to you if you can get customers to write up 100+ words or more. Google has mentioned that the purpose of the local review system is to persuade customers to check-in and publish reviews, while they’re still at, or after departing from your business. In this sense, reviews from mobile devices are probably a little more ideal. Sign in to your Google Places for Business account. 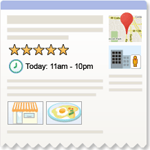 Click See your listing on Google Maps by the business that has a review you want to respond to. This will take you to the corresponding local Google+ page. Just click Respond next to the review and write your response. When it comes to social signals and your ranking, there’s a whole slew of measurable social actions beyond just ratings and reviews. Google looks at all different signals, and from a variety of sources, like the quantity of +1’s and shares (as well as who and where they are coming from), check-ins, Facebook like's, Twitter followers, shares and mentions. Another tip, in addition to the 10 listed above, is to incorporate structured markup for your website testimonials. If you feature testimonials or endorsements on your home page, convert them to Schema.org format. This will often result in Google including the text as a review when displaying local listings in search results. Google describes how to do this and recommends it for local search.